It’s St. Patrick’s day! On this day when beer is green and celebrations abound, why not have some friends over to play a fantasy drinking game? Enter the Red Dragon Inn. This fun, lighthearted party game for 2 – 4+ players takes about 45 minutes to play. It is set in the fantasy town of Greyport where you and a group of your fellow adventurers get together at the local pub after a long day of dungeon crawling. The aim of the game is stay sober the longest and maintain a supply of gold via gambling and trickery. If you become drunk or lose all your gold then you’re out! The last player standing who is not drunk and with at least one gold remaining is the winner! While there are wiser choices to be made on a day of heavy drinking, no beer is better suited for the Red Dragon Inn than Dragon’s Milk. This bourbon barrel stout weighs in at 11% abv and is available year-round from New Holland Brewing Company. It pours pitch black with two fingers of quickly dissipating light tan head. The aromas that rise from the freshly poured glass smell of dark malt with notes of bourbon and caramel and hints of dark chocolate and toffee. The overall flavor is sweet, starting out as a mix of dark fruit and creamy chocolate with hints of vanilla. It ends with a tart cocoa powder bitterness. It is a full-bodied beer with a moderate amount of carbonation. Overall it is a great dessert beer to enjoy during a game with friends after dinner. 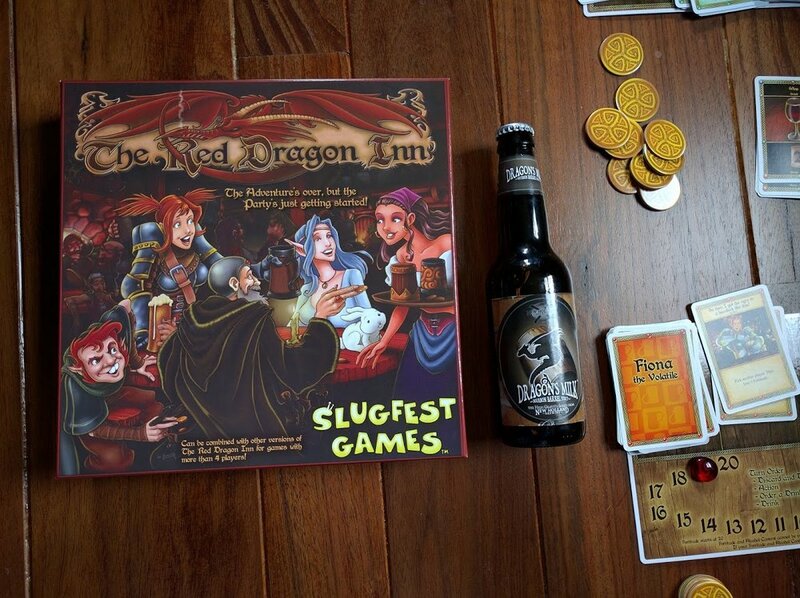 So, if you’re interested in fun games and great beer, call some friends, pick-up a four-pack or bomber of Dragon’s Milk and enjoy St. Patrick’s day in the fantasy realm of the Red Dragon Inn. If you don't have access to Dragon's Milk or have another favorite beer you'd suggest for this pairing, share your thoughts in the comments below. Kickstarter Slugfest games recently launched a kickstarter for their newest game “Battle for Greyport.” The Battle for Greyport Kickstarter is fully funded and will end on April 1st 2016. Character Expansion Packs There are currently close to 30 characters available to play with the Red Dragon Inn. These can be found in Red Dragon Inn 1 - 5 as well as many individual character expansion packs. The full list can be found on Slugfest Games. Amazon and your FLGS have many of the expansions available as well. 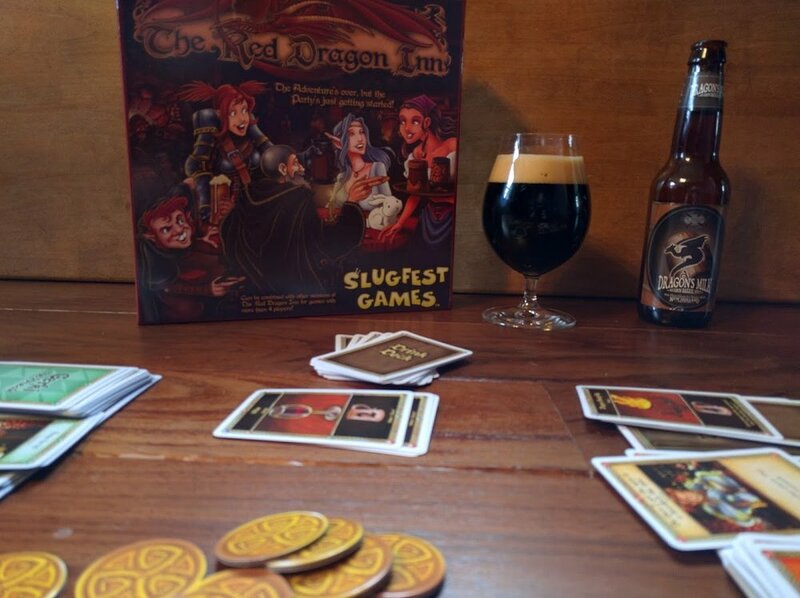 Metal Coin Enhancement If you want to further enhance your game playing experience, Slugfest Games has real metal coins available on their website here.